The problem solving process can be divided in different. ways and the stages have been given various labels. This has been done to make it easier to understand but how it is divided and the labels that are used are not important. To be a successful problem solver you need to understand what the stages involve and follow them methodically whenever you encounter a problem. These stages are examined in detail in later articles, but here is a summary of what is involved at each stage. Obviously, before any action can be taken to solve a problem, you need to recognise that a problem exists. A surprising number of problems go unnoticed or are only recognised when the situation becomes serious. Opportuni­ties are also missed. There are specific techniques you can use to help you recognise problems and opportunities. Once you have recognised a problem you need to give it a label..... a tentative definition. This serves to focus your search for relevant information, from which you can write an accurate description or definition of the problem. The process of definition differs for closed and open­ended problems. With closed problems you need to define all the circumstances surrounding the deviation from the norm. Sometimes this will provide strong clues as to the cause of the problem. Defining open-ended problems involves identifying and defining your objectives and any obstacles which could prevent you reaching them. The problem definition provides the basis for finding solutions. Closed problems generally have one or a limited number of possible solutions, while open-ended problems usually can be solved in a large number of ways. The most effective solution to an open-ended problem is found by selecting the best from a wide raJ.1ge of possibilities. Finding solutions involves analysing the problem to ensure that you fully understand it and then constructing courses of action which will achieve your objective. Analysing the problem involves identifying and collecting the relevant information and representing it in a meaningful way. Analysing closed problems helps you to identify all the possible causes and confirm the real cause, or obstacle, before looking for a solution. With open-ended problems you are looking for information which will help to suggest a range of possible ways to solve the problem. Analysis also helps you to decide what the ideal solution would be, which helps to guide your search for solutions. Constructing courses of action to solve the problem involves discovering what actions will deal with any obstacles and achieve your objective. Workable solutions are developed by combining and modifying ideas and a range of creative techniques are available to help in this process. The more ideas you have to work with, the better your chances of finding an effective solution. A problem is only solved when a solution has been implemented. In some situations, before this can take place, you need to gain acceptance of the solution by other people, or get their authority to implement it. This may involve various strategies of persuasion. Implementing your solution is the culmination of all your efforts and requires very careful planning. The plan describes the sequence of actions required to achieve the objective, the timescale and the resources required at each stage. Ways of minimising the risks involved and preventing mistakes have to be devised and built into the plan. Details of what must be done if things go wrong are also included. Once the plan has been put into effect, the situation has to be monitored to ensure that things are running smoothly. Any problems or potential problems have to be dealt with quickly. When the action is completed it's necessary to measure its success, both to estimate its usefulness for solving future problems of this type and to ensure that the problem has been solved. If not, further action may be required. 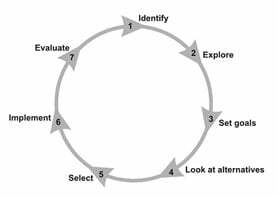 These stages provide a very flexible framework which can be adapted to suit all problems. With closed problems, for example, where there is likely to be only one or a few solutions, the emphasis will be on defining and analysing the problem to indicate possible causes. Open-ended problems, on the other hand, require more work at the idea generation stage to develop a large range of possible solutions. At any stage in solving a problem it may be necessary to go back and adapt work done at an earlier stage. A variety of techniques and strategies are available to help you at each stage and these are described in later articles.